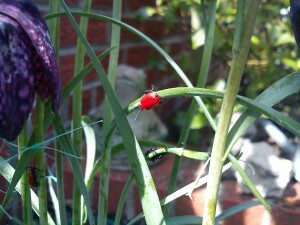 No – not a new pop star, but a bug which has decided to invade my garden – after my Fritillaria. It is a very nice looking bug, but basically eats the whole plant until there is nothing left. The RHS are conducting a survey into the spread of this creature in the UK. It seems to be found in all counties now, and is working it’s way north. I had them once before several years ago on a lily in my front garden and found them very hard to control. So much so that the lily was destroyed, and never reappeared. I am trying picking them off by hand and keeping an eye out for the eggs and larvae – fingers crossed that I manage to stop them eating everything this time. Living in the UK we have been blessed recently (well, last May), with a coalition Government between the Conservatives, led by David Cameron, and the Liberal Democrats, led by Nicholas Clegg. This coalition came about because no party gained enough votes to hold an overall majority. I read this as meaning that the public who voted were not enamoured enough of the policies of any party to declare an outright winner. Unfortunately, they didn’t see it this way and have taken their ‘election’ (and I use this term in it’s loosest possible sense), as a direct mandate from the masses – the 65% that turned out. Since the coalition came in we have seen an assault on everyday working people and the country in general. How else could you explain the amazingly drastic cutbacks and changes that this government have so far implemented. Currently they are dismantling the National Health Service – despite the Health Secretary, Andrew Lansley, promising that there would be “..no major top-down reorganisation of the NHS..”. They are expecting Doctors to manage the Health Service. Have they never heard of the ‘Peter Principle’? I feel that people in the UK are not happy with what is happening at present. The cost of living is increasing dramatically, inflation is on the rise, fuel duties increase (fuel duty plus Value Added Tax means that 70% of every pound spent on fuel goes to the Treasury), squeezing the ‘middle earners’ and so on. Not to mention scrapping the Ark Royal and getting rid of all the Harriers (another issue). Now they are talking about increasing interest rates to counter inflation. How does that work? I have already cut down on my heating (gas) and electricity usage. 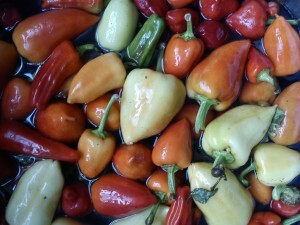 I buy less food – and that which I do buy tends to be own brand or cheaper. I have an allotment – so I grow some of my own food – as much as I can. I haven’t bought new clothes or furniture for many months, and don’t intend doing so. I don’t go out to pubs, clubs, theatre or cinema. I don’t drink that much at home. I eat a balanced, often vegetarian diet. I am selling my 2.0 litre car, and will not replace it. I bought a cheap bike from Tesco and will try to use that as much as possible. I have even cut my use of the washing machine down to once a week! Am I doing my bit? Probably not – as part of the ‘Big Society’ looming on the horizon I will be expected to take a more active part in the community no doubt. Perhaps running a local play group, or the Library – if the Council hasn’t closed it down – as seems likely. May be sweeping the leaves from the pavements or providing grit in the next cold snap. Community policing maybe, or tending parks and gardens – all for no remuneration of course – except for the warm feeling that I am making the world a better place. Makes me wonder if John Carpenter’s film ‘They Live!’ was a glimpse into the future. Pass me the sunglasses………. I have just bought one of these little computers to use as a media centre – attached to my TV. It comes out of the box with a version of Linux on it named ‘Linpus’. I had never heard of this version before. It seemed quite user friendly when I booted it up however my main purpose in buying the machine was to play video files. So I put a file onto a USB stick and offered it up. The media player program started up, looked at the file and basically said that it couldn’t play it. Looking on the web, others say that Ubuntu is a better version of Linux to use. I have had a go at using SUSE and Red Hat in the past – all goes swimmingly until something goes wrong – then I have inevitably had to wipe the machine and install a Microsoft product again. I’ll keep trying though. Not being the Linux expert I would like to be I thought I would try and put XP onto the machine, because I have used that for quite a few years. Problem is, as I have said, is that the computer doesn’t have an optical drive. This means that I had to try and install from a USB stick. I trawled the net to find out how to do this – and there’s a lot of info out there. First off I knew from experience that getting XP drivers for the machine was important. The machine uses an NVidia chipset, so I trawled their website to find the right ones. Then I had to find some other bits – like the wireless network driver. In case you are interested, here are the links: Graphics, Sound, Digital Audio, Motherboard,Wireless Network. Then I got into the computer BIOS by pressing ‘Delete’ whilst the machine was booting and checked that the hard drive type was not set to ‘AHCI’ – because that causes problems. Then I changed the boot priority to the ‘removable drive’ – ie, the USB port. Now I had to make the USB boot stick. I chose a 4GB stick and looked on the web for instructions. After a few false starts (about 2 hours worth), I found this site which although not specifically about the revo, has the details that I needed. Making sure that I had my real copy of Windows XP Pro, I set about the task of making the stick. It didn’t work – but I got farther than I had before. I kept getting messages like “ntldr missing” and “missing or corrupt hal.dll” . Looking through the files on the stick, I could see that these files were actually there – it was just that the machine didn’t seem to be able to find them. Having worked on computers for a little while I thought I would try moving the files to help the machine find them. There were two main folders on the stick ‘$WIN_NT$.~BT’ and ‘$WIN_NT$.~LS’. The latter one had all the files in it, whilst the former had only a few. I copied the contents of the latter into the former and tried again. Ho Ho – it worked! The boot process took quite a while – but then the install started. It is important that when booting from this stick you do not remove it until the entire process has finished – that is until you can see the Windows desktop. Even through a few reboots. Then wait for a while and remove the stick. Incidentally, if the machine tries to boot from the hard drive rather than the stick, press f12 as the machine boots to choose the boot menu. Then choose the stick. If you have successfully downloaded the drivers listed above, you now use them to make the system happy. I found that the digital audio driver did not work until it was the last one to be loaded. Even then I had to go to Device Manager and choose to update the driver on the last yellow question mark – pointing it to where I had stored the files. Not untypical for XP. After putting on a free antivirus product and VLC Media Player. I connected the thing to my TV and off I went. The only problem that I had was getting sound using the HDMI lead to connect to my HD TV. Using the NVidia graphics control console soon sorted the screen out – I have it cloning – so I see the same on both screens (it sees the TV as two screens – one as a monitor, one as a TV). The ‘TV’ screen is HD when using the HDMI lead – but no sound. The ‘Monitor’ screen has sound – because I used a 3.5 jack connection into the TV. Eventually solved it by using the Sound options in Control Panel to choose the NVidia Digital Sound as default rather than the Realtek. This means that it now comes through the HDMI lead but, you’ve guessed it, no sound on the ‘Monitor’ screen. If I just use the ‘TV’ screen to control the computer, this isn’t a problem. I can now watch HD files on the television, and use the internet to connect to various sites that broadcast TV – like the BBC iPlayer service. All seems to be working well. It’s just a shame that I don’t watch that much TV. Still – it’s the challenge of the new – and I like to keep up with technology. I’ll think about that. I realised a while ago that most of the places that I wanted to go to on our planet had quite a lot of volcanic activity. Don’t know why – just turned out that way. Then I found the IRIS Seismic monitor website. Wow! If you want to see how things are going – have a look for yourself. I find it fascinating (perhaps I should get out more). Website is here. By the way – it’s snowing here in the UK at the moment. The most snowfall we have had at this time for 17 years it seems. Are things changing?